Is One On-Campus School Police Officer Enough? Sage Creek’s Officer Valentine’s police car parked in front of the new PAC. This is Officer Valentine’s first year at Sage Creek and he hopes he can do whatever he can to protect the campus. Parents, teachers, administrators, politicians and police officers across America have one question that no one can seem to currently answer: Are our students safe at school? School shootings are becoming increasingly common within the last few years. Headlines involving, “guns,” “shootings” and “lives lost” has become a less shocking statement. The shootings that are taking place throughout our country are leaving immense death counts in all levels of the education system. Parents, family and friends are left wondering, “who is safe?“ U.S. Parents have tuned into news networks hearing that the school of their child is being attacked and then never get the chance to watch their kid walk up the driveway after a long day of school ever again. Since the Sandy Hook Elementary shooting that took place on Dec. 14, 2012, in Newtown Connecticut, 23 school shootings have occurred in which more than 400 people have been shot by an active shooter. Due to this nationwide epidemic, School Administrations have decided to deploy on campus police officers to help ensure safety. Carlsbad police officers line up ready to protect the town of Carlsbad from any dangers. These officers will never stop to protect and serve their town and department. At Sage Creek High School, Officer Kam Valentine is the one, full-time policeman patrolling the campus halls. 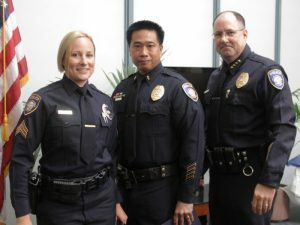 Valentine joined the Carlsbad Police Force 10 years ago, deciding to take the job as the first-ever full-time school police officer at SCHS this year. Valentine is available to speak to students with concerns, patrol activities across the Sage Creek campus and keep up with all of the events that take place within the campus walls. 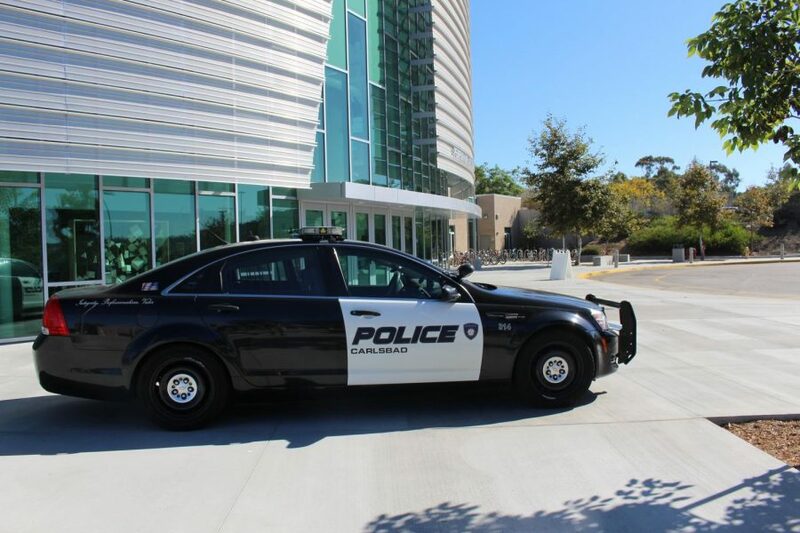 This is the first year Sage Creek hasn’t had simply a part-time officer, this shows CUSD is taking a step in the right direction for the protection of students in Carlsbad. Like most campuses, there is currently only one officer on the school grounds. Although, is one full-time officer enough? 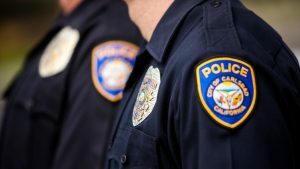 Carlsbad police officers lined up after auditioning for the position of lieutenant officer. These officers always work hard and are dedicated to the Carlsbad Police Department and the responsibilities that come with a badge. Sage Creek should add another full-time officer. Sage Creek currently has over 1,200 students. With only a single police officer responsible for protecting all the massive amount of students, another officer should most definitely be added as a member of the school’s staff. Having the role of a school officer, one is given three main roles: a Law Enforcement officer, law-related counselor and law-related educator. The multitude of roles reveals that school officers have more responsibilities outside of only protecting students that attend the school. Another idea has come up to protect students, which is arming teachers and staff to further protect students from school intruders. This strategy could possibly result in bad and dangerous events, such as a teacher using the weapon in hatred or a student possibly stealing a gun for harmful purposes. This alternative solution to a current nationwide problem with all of its controversy and room for error can easily be avoided with multiple full-time officers on the school campus. Without adding another officer to the Sage Creek staff, students could increasingly be left at risk and with the protection from one officer being much less effective than possibly the protection from multiple officers. This could cause danger if that officer is off-duty and if the officer is too far from the crime. Death counts could rise and cries could arrive. Getting more police control on the Sage Creek campus is beyond something to consider to think about in terms of Sage Creek’s future, it’s something that should occur now. Nice article Cooper. I love your passion and enthusiasm for all things in life; you bring so many joy to everyone in the class and our campus. Keep on keepin on bro. The Sage loves you!